Coming Soon to a Farm Near You - Legal Hemp? 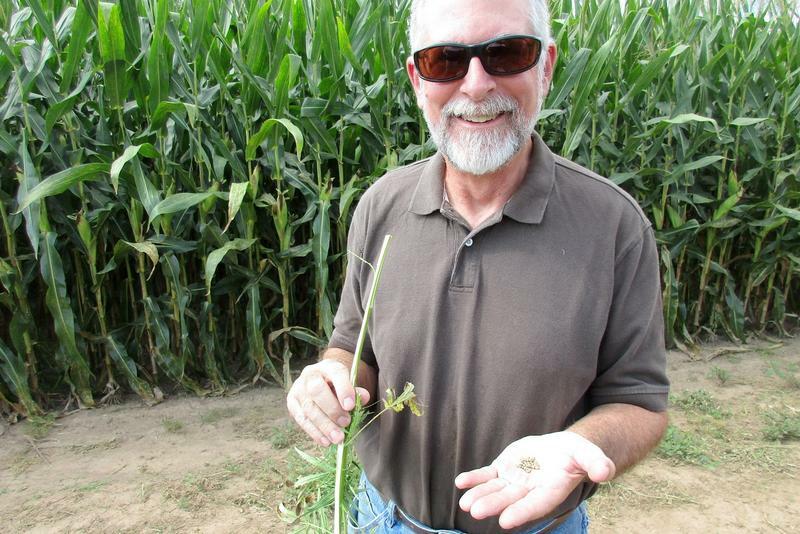 Farmer Glenn Rodes provides farming expertise for Renfroe’s research. 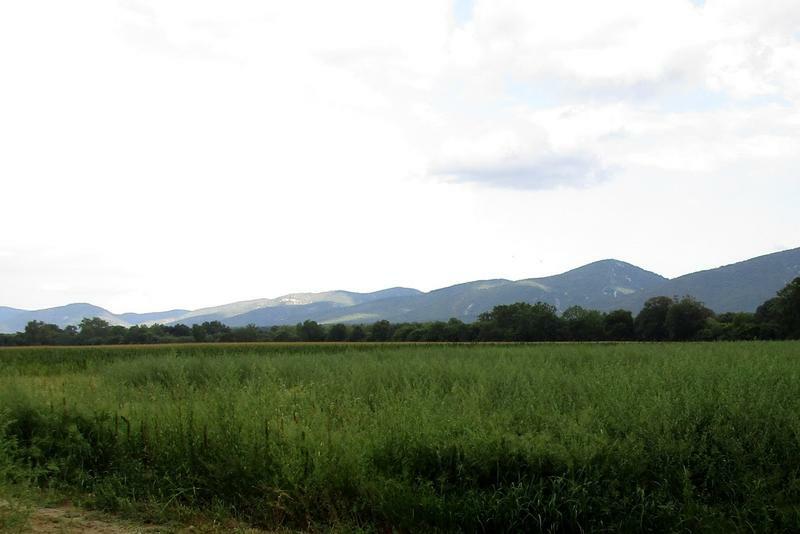 James Madison University biology professor Mike Renfroe is researching industrial hemp in this 10-acre field near Port Republic. Professor Mike Renfroe with hemp seeds. The hemp field is surrounded by corn fields. 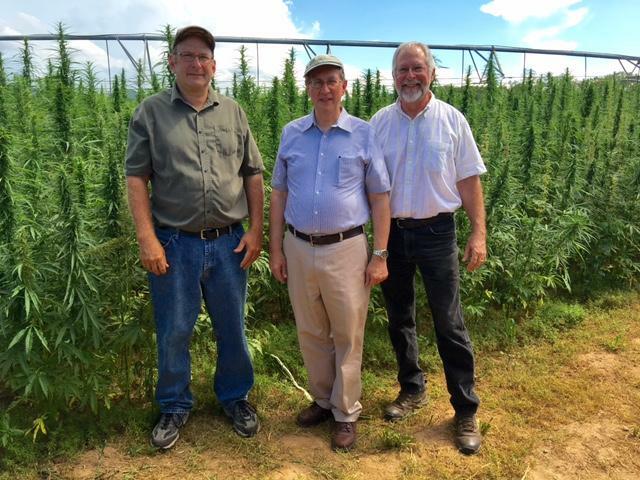 Farmer Glenn Rodes, Representative Bob Goodlatte, and JMU professor Mike Renfroe at the hemp field. WMRA’s Christopher Clymer Kurtz with Mike Renfroe at his field of industrial hemp. Growing and processing hemp is against the law in the United States. But 6th District Representative Bob Goodlatte wants to see industrial hemp become a legal crop for farmers, and a JMU professor is developing that potential option. WMRA’s Christopher Clymer Kurtz reports. After a while, you almost begin to wonder what industrial hemp can’t be used for. USES [voices of MIKE RENFROE, GLENN RODES, BOB GOODLATTE]: Rope — insulation — automobile parts — chipboard — particle board — animal bedding — hempcrete — clothing — creams — hand lotions — body lotions — It can replace fish oil in your diet — nutraceuticals — biodiesel — pharmaceuticals — Just about anything that you can make out of plastic — canvas sails — composite construction materials — flooring — ceiling — acoustic tiles — human food — Literally tens of thousands of uses for hemp. REPRESENTATIVE BOB GOODLATTE: It’s not something you can cut off the plant and light it up and smoke it. Representative Bob Goodlatte* is one of 16 co-sponsors of a bill called the Industrial Hemp Farming Act of 2017, introduced this summer to “amend the Controlled Substances Act to exclude industrial hemp from the definition of marihuana, and for other purposes.” The bill has been referred to the Committee on Energy and Commerce, and the Committee on the Judiciary, which Goodlatte chairs. GOODLATTE: Consumers right now buy hundreds of millions of dollars worth of hemp products every year, but unfortunately all of the hemp and the production of the product has to take place outside the United States, and we want to change that with this law. Because growing and processing hemp has been illegal for many years, there’s a lot of catching up to do — permitted research. 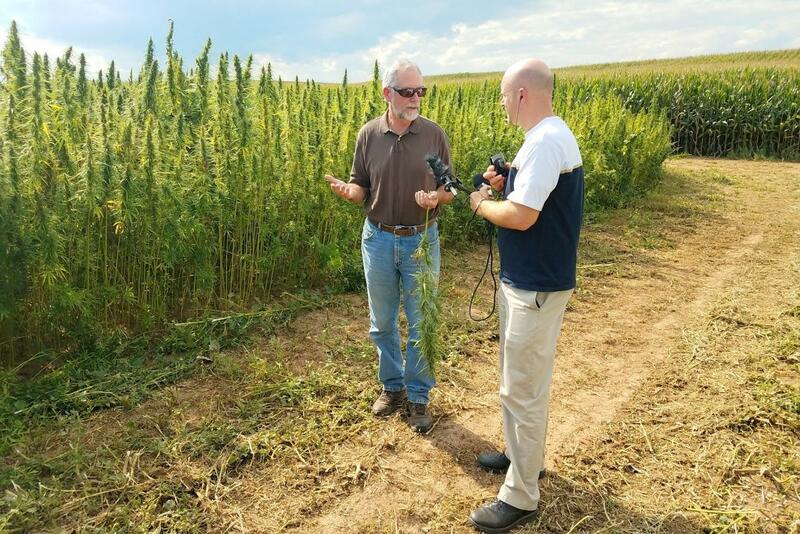 On a Rockingham County farm, tucked deep inside a corn field where a harvester and trucks were recently at work, is a 10-acre plot of hemp, one of seven plots totaling between 40 and 50 acres that James Madison University biology professor Mike Renfroe is using in his research. MIKE RENFROE: What we really need is to find what cultivars are well suited to Virginia, and then breed and start improvement programs among those cultivars and really produce Virginia-specific cultivars that are going to work best for our farmers here. His partner in research here is farmer Glenn Rodes. GLENN RODES: This crop is seventy years or more behind other crops in research, so when you even look at yields on our crops, those are probably 1930 yields. Hemp does have a history here in the Valley — it was one of the crops that the first British colonies were required to grow for the crown. RENFROE: Hemp is really what kept the British navy afloat because they would use the fibers for making the canvas sails and also making the rope for the rigging. This part of Virginia, right here in the Shenandoah Valley, in the late 1600s, early 1700s, was the nation’s largest hemp-producing region. But by the 1970s, the hemp market had been shut down. Hemp is related to marijuana just like brussel sprouts are related to broccoli: they are different cultivars of the same species, Renfroe said. The 1970 Controlled Substances Act outlaws the whole cannabis sativa species under Schedule I, even though hemp plants are very different from marijuana. Hemp plants are tall and slender and must have THC levels below 0.3%, whereas marijuana growers want lots of leaf and flower material — and much, much higher THC levels. RENFROE: Between the difference in visibility, and the bad breeding effects that would come along with it, I don’t think that’s a big concern. 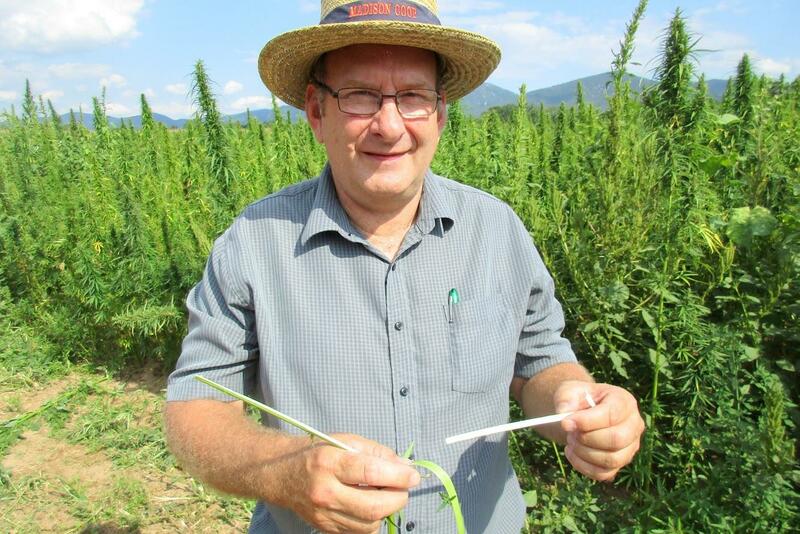 Out at the hemp field, Rodes picks a stalk to show its different parts. RODES: I’m sure this doesn’t translate well to radio, but this fiber is extremely tough. I mean, if... I’m not. I just can’t tear that. Now you can get it down to where it’s small enough where you can tear it, but it’s extremely tough. This is the hemp heart. It’s the inner part of the seed. That is a very nutritious product. You can buy it commercially now. It’s just amazing that we can’t grow it and sell it here. Renfroe says that hemp could be a replacement crop for former tobacco farmers, because farmers can get good yields off of even smaller farms, yields that Rodes thinks could eventually be a really good cash crop. He says farmers are excited to join the market. The work of bringing together farmers and processors to establish manufacturing streams for a crop that’s still illegal isn’t finished yet, but Representative Goodlatte is optimistic about the prospects of removing the legal barrier to making hemp a domestically produced commodity. GOODLATTE: I think it’s going to have very broad bipartisan support. It should pass the House easily. The United States Senate is another question, but again, I think it will have bipartisan support there. Commercial production hopefully will occur in the near future. But you never know how long the legislative process is going to take. *We tried to ask Goodlatte for comment on other issues besides hemp, but his press secretary said he was out of time.